Lucasfilm Publishing hosted a panel at New York Comic Con 2017 to showcase the writers who added backstory and new story arcs for fans of all ages. NEW YORK — The writers who fill out the "Star Wars" universe with novels, short stories and children's books gathered Oct. 6 at New York Comic Con to discuss what it's like to write for the iconic series. The "Tales from a Galaxy, Far, Far Away!" panel on Oct. 6, hosted by Lucasfilm Publishing, presented 12 writers, including Ben Acker, Christian Blauvelt, Delilah Dawson, Claudia Gray, Elizabeth Wein and Charles Soule. The cover art for "Star Wars: Bloodline" by Claudia Gray. "I was writing a Leia who was just a few years older than I am," Gray shared with the packed conference room at the Javits Center in New York. "[I was] sort of imagining, 'OK, she is still this incredible heroine, and she's still smart and funny, but she's still at this point where … it's a Leia who hasn't sent people to die yet. … She's got that core, but she's still not as tough as she'll be." Gray also shared with the audience that she wrote fan fiction after becoming engrossed in the "Star Wars" mythology at the age of 7, admitting that she made a nod to that early work in her 2015 young adult book, "Star Wars: Lost Stars." The cover art for Ben Acker and Ben Blacker's second "Star Wars: Join the Resistance" book, "Escape from Vodran." Another children's book author sitting on the panel was Ben Acker, who wrote his most recent "Star Wars: Join the Resistance" book, "Escape from Vodran" (2017, Disney-Lucasfilm Press), with co-author Ben Blacker. Acker enthusiastically described the work as "'Goonies' meets 'Star Wars' … about a bunch of little kids that join the resistance." Blauvelt tackled the franchise as nonfiction. His book, "Star Wars Made Easy" (2017, DK Publishing), is a basic introduction to the iconic characters and themes of the series that, as he revealed during the presentation, he first became exposed to upon renting a VHS tape from Blockbuster shortly before his 10th birthday. The cover art for Christian Blauvelt's book, "Star Wars Made Easy." "It was incredible! It was such a transformative experience … it was like taking your first step into a new world … and that's a really powerful thing," Blauvelt told the audience. He said his introductory book was a tricky project because he was so familiar with the plot essentials. "I've been familiar with 'Star Wars' for decades, and it's like, how do you start with the basics … you realize it's pretty challenging to explain some key concepts, like 'the Force.'" Artwork for Delilah Dawson's story "Scorched," which was published in "Star Wars Insider 165." Dawson, who wrote the novel "Phasma" (2017, Del Rey) and the "Star Wars" short stories "Scorched" (2016, Titan Magazines) and "The Perfect Weapon" (2015, Del Rey) said that she seeks inspiration from films like 1984's "Dune" and anything Viking-related. At the end of the panel sat Wein, who said that her flying license has informed her writing, in both her "Star Wars" and World War II-related stories. "The grittiness of [flying] … you are totally focused on getting back down to the ground safely, and an awful lot of what you do is just going through the emergency procedures over and over again," Wein said. She wrote the story called "Change of Heart" for the 40th anniversary of "Star Wars'" anthology, "From a Certain Point of View." (2017, Penguin Random House). A Darth Vader figurine from toy-maker Hasbro's Star Wars Legacy Pack, released in February for the 40th anniversary of the franchise. One of the most surprising moments from the panel came when Soule revealed he had to leave the table early, because, "I've been summoned by Luke Skywalker, I'm told." After the crowd laughed, he rushed through a breakdown of the challenge in writing the character Darth Vader, who was a villainous favorite among fans. "Darth Vader does evil things, but people love him. … How can I write a book about this thing?" 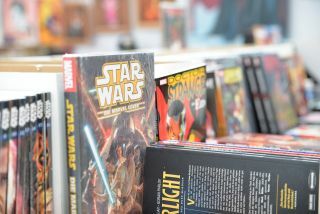 Soule, who has written comic series for the franchise such as the ongoing "Star Wars: Poe Dameron" series, said that the storytelling process has helped him to understand why Darth Vader remains such a popular character. He then made his quick exit, to do what so many in the audience wish they could: meet the iconic actor who portrays Skywalker, Mark Hamill.